A clearly liveried fleet of commercial vehicles raises a company’s identity, boosts its marketplace profile and is calculated to generate a significant number of inquiries from the thousands of people per hour who see such vans operating in busy areas. That’s why Pimlico Plumbers’ engineers wear a smart company uniform and drive identical, spotless blue, white and red-liveried vans displaying the organisation’s brand. The company employs a six-strong team of cleaners and valeters to ensure, says transport manager George Lusham, there are no excuses for engineers arriving at a job with a dirty van. This has been the company’s philosophy since it was founded in 1979 by entrepreneur Charlie Mullins in the basement of an estate agent in Pimlico, after he completed a four-year apprenticeship in plumbing, with just a second-hand van and a bag of tools. His vision then was, according to the company’s website, “to remove the stigma associated with the plumbing industry: plumbers with bad workmanship, who turn up late, rip off the customer, drive rusty old vans, do not wearing uniform and have arses hanging out of their trousers”. 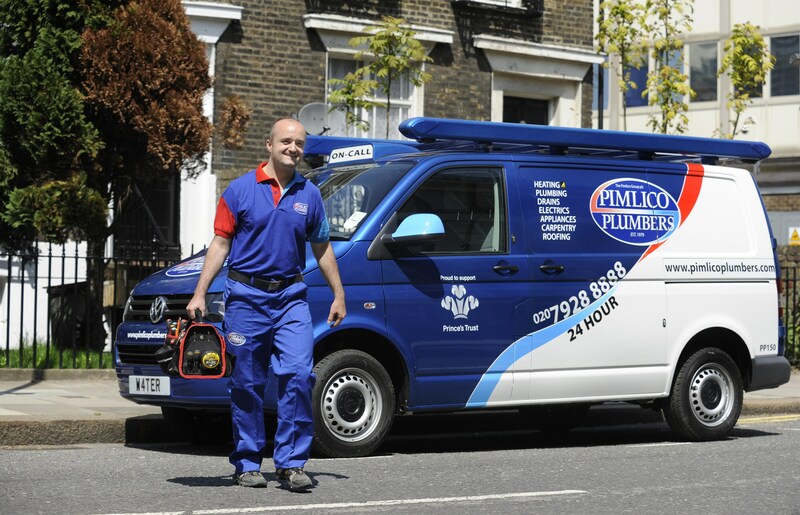 Adherence to that vision has seen Pimlico Plumbers grow from a plumbing and heating business to deliver a total property maintenance service 24x7 across the capital, employing roofers, carpenters and electricians, as well as plumbers. Now based in Lambeth, the business undertakes more than 80,000 jobs a year and runs a rapidly expanding fleet of 162 identical Volkswagen Transporter Trendline 2.0 TDi 140ps models operating across greater and central London. A total of 17 new vans were added to the fleet last year, and more will join this year, as the business continues to expand. Pimlico Plumbers purchases all of its vehicles – the fleet also includes 10 Volkswagen Golfs driven by estimators – and undertakes all service, maintenance and repair work through its own workshop and bodyshop facilities, only utilising franchised dealers for any warranty-related jobs. Given the current trend for outsourcing and for many organisations to move away from running their own workshops, the company believes keeping its entire fleet operation in-house contributes to its success. While image is important to Pimlico Plumbers, so is managing vehicle downtime, with the company setting its own rules for service and maintenance. These entail ensuring all vans are in the workshop at least every 10-12 weeks, irrespective of mileage. Those guidelines include keeping it in pristine condition inside and out, undertaking daily defect checks and ensuring any “dings and dents” incurred are reported and repaired immediately in the bodyshop. A 12-strong team in the workshop and bodyshop is on hand 12 hours a day, six days a week, to undertake all servicing and remedial work, explains Lusham. 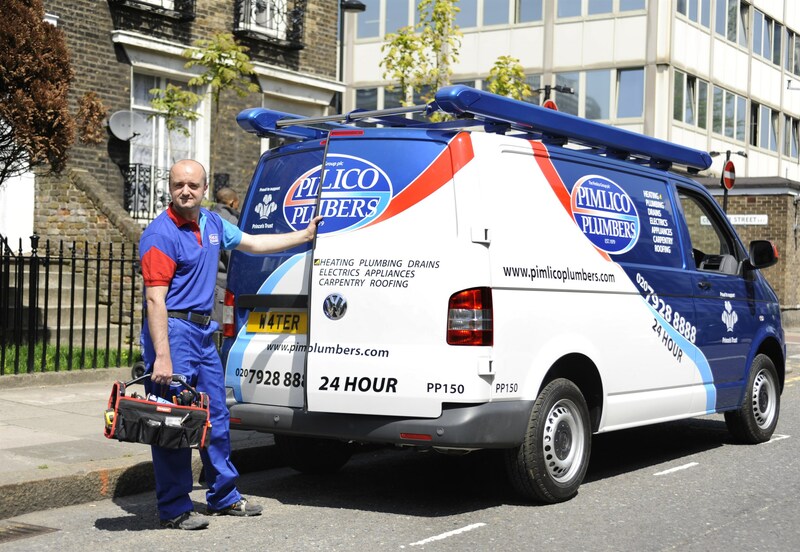 Pimlico Plumbers retains a ‘reserve’ fleet of six vehicles, which are used as spare vans, allocated to engineers, so service, maintenance and repair work does not interfere with schedules. “If necessary we will take a van to an engineer’s location and swap it, so their work schedule is not impaired by the need for maintenance work. Clients expect Pimlico Plumbers to deliver a top-class service and don’t want excuses because a van was not available,” he says. Further underlining how the company’s fleet strategy is different from the norm is the fact that its van replacement service still has a 1998-plate S-registered vehicle in daily use, also underlining the solid reputation of the Transporter. “We don’t dispose of any vehicles; we just keep expanding the fleet to meet business requirements,” says Lusham, highlighting the fact that the Transporter’s reliability further promotes the right image of the business. Given that policy, and the introduction of London’s Low Emission Zone in February 2008, Pimlico Plumbers undertook remedial action to fit filters to ensure vans complied with the legislation. As London mayor Boris Johnson and Transport for London considers introducing an Ultra Low Emission Zone (ULEZ) from September 2020, how the fleet will comply with the proposed legislation figures high on Lusham’s agenda. Engineers work exclusively for Pimlico Plumbers and live across greater London, taking their allocated van home with them each day. Collectively, the fleet operates some 260,000 miles annually, with a fuel bill topping £1 million when fuel prices peaked last year and, says Lusham, despite the urban nature of the business, the company’s established diesel-only policy currently meets all requirements. If the ULEZ is given the green light this year, businesses will have a five-year window to get their fleet in order to comply with the regulations, or face a daily entry charge. Lusham says: “When we know exactly what the regulations are, we will start to plan how the fleet will look to ensure that we comply. Like all transport managers, cost reduction is crucial for Lusham, who admits he is always on the lookout for new vehicle suppliers to ensure he buys vans at the best price. “We always buy the same model and specification through the Volkswagen dealer network, and I always try and get the best price – the same applies for parts. Dealers will quote me a price and I will buy accordingly,” he says. Once acquired, many of the vans are fitted with personalised number plates, further reinforcing the company’s image with customers, who frequently ask for tradesman by the registration of the van – BOG1, LOO3, GAS15, W4TER, F1USH and 701LET are just some examples – rather than by plumber name. All vans are fitted with telematics, enhancing the robustness of Pimlico Plumbers’ occupational road risk policy, while also ensuring its operations team can simultaneously monitor the location of tradesmen so new jobs can be allocated efficiently. Since joining the company, Lusham has beefed-up its at-work safety policy by turning to the Freight Transport Association’s driver licence checking service, which is provided by the Licence Bureau. Previously, licence checking was managed internally and was an administrative burden with engineers having to attend in person for checks. Lusham says: “We have since uncovered a number of engineers with points on their licence, which they had not disclosed, although they were all entitled to drive. We have found that having telematics in vehicles, and the more robust licence checking system, has resulted in tradesmen almost self-policing themselves when driving. Easy to do all these things when you have an hourly rate that makes a central London Bentley dealer's rate look cheap!